For the first time in 16 years, the Pitt men’s basketball team left the annual City Game against Duquesne with a loss instead of a trophy. The Panthers (6-2) fell to their crosstown rival Duquesne Dukes (4-5) by a final score of 64-55 Friday evening at the PPG Paints Arena, their first loss in the series since 2000. Stallings removed leading scorer Michael Young from the starting lineup against Gardner-Webb in November for the same reason, although he allowed Young to play in the game. Young scored the first basket of the evening for Pitt, as senior guard Chris Jones fed him in the paint to give him an easy lay in. Jones was the only player on the Panthers that Stallings was pleased with. 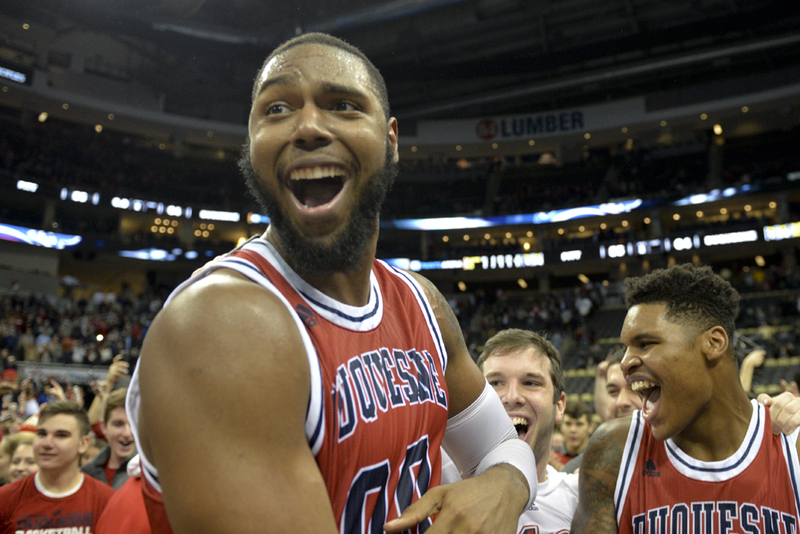 Duquesne started out strong from three-point range, hitting three of its first four shots from long distance via shots from guards Tarin Smith, Mike Lewis II and Emile Blackman. Young kept Pitt in pace with the Dukes though, scoring six of the Panthers’ first eight points. Trailing 11-10 at the first media timeout, the Panthers retook the lead after a steal by sophomore guard Cameron Johnson. Young then found Johnson driving to the hoop on a fastbreak for an easy layup. The Dukes would temporarily retake the lead on a dunk by center Darius Lewis, but Johnson returned the favor with a 3-pointer that gave Pitt a two-point edge heading into the second media timeout. The Panthers seemed like they had created some separation, thanks to a 12-2 run that featured a spinning pirouette reverse layup by Young and a 3-pointer by Sheldon Jeter, which gave the Panthers a 30-20 lead. But Duquesne clawed back, as Pitt went cold from the field. The Dukes ended the half on a 9-0 run, punctuated by an and-one layup by Blackman to bring the Pitt lead down to one with 19 seconds left in the half. 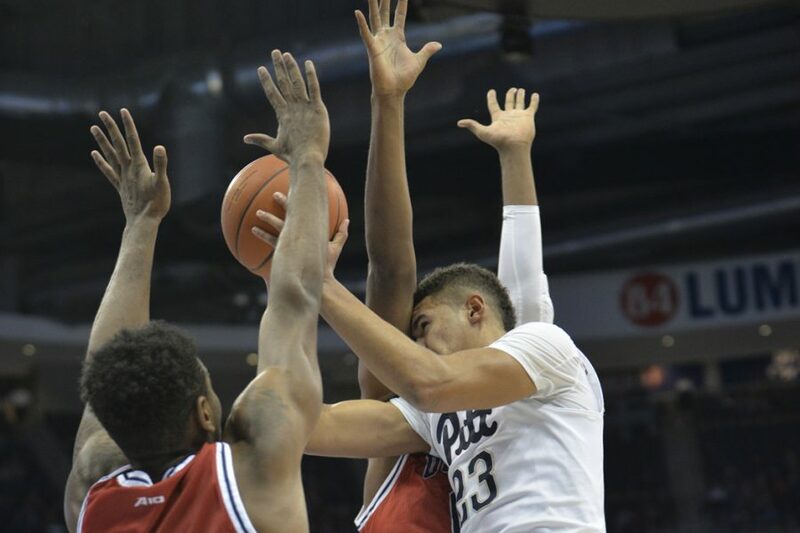 Pitt had an opportunity for the final shot in the half, but, with his back facing away from the basket, Michael Young didn’t see the clock, and didn’t get his shot off in time. After a Young jumper to start the second half, Duquesne took its first lead since the 11:40 mark in the first half, scoring six unanswered to give the Dukes a 35-32 advantage. Pitt would retake the lead on two straight buckets by Jones, going up 36-35. But Duquesne pulled off another run, this time 7-0, to take a 42-36 lead with 14:38 remaining in the game. After the first media timeout of the second half, the Panthers switched Jones — normally a shooting guard — to the point. But the Dukes maintained control, as Lewis II hit another three to push Duquesne’s advantage to a game-high nine points. Jones said he was prepared to take over the ball-handling duties. Pitt would surmount that deficit, thanks to the play of Jones and Johnson, who combined for six straight points to bring the Panthers back within one. The Panthers then regained the lead with 6:55 left on a layup by junior forward Ryan Luther, but guard Rene Castro gave the Dukes the lead right back on their next possession with a three from straight away. That lead grew to five on another 3-pointer by Blackman after Young missed a defensive rebound. The Panthers appeared to have a chance at a tying possession, as Duquesne’s Isaiah Mike missed two free throws. But Luther, who grabbed the rebound, fell out of bounds, and the Dukes scored on the renewed possession to extend their lead to four. Luther then fouled Lewis II on a three, who proceeded to make all three shots and extend the gap to seven. 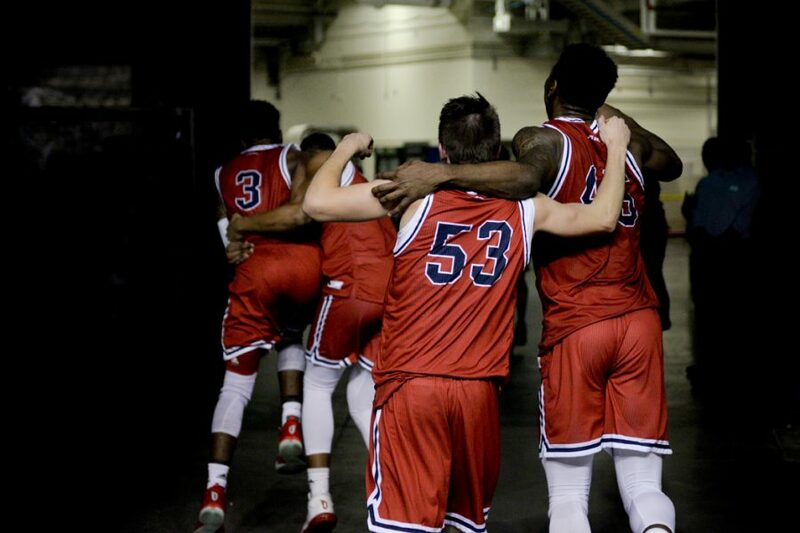 The Panthers wound up falling by a score of 64-55, as Duquesne fans in the arena stormed the court. Young led Pitt with 19 points but was just 1-11 from the field in the second half. Blackman paced the Dukes with 21. The Panthers will look to rebound on Wednesday, Dec. 7, when they return to the Petersen Events Center to host Buffalo at 7 p.m.